Sometimes life gets up and slaps you in the face, just to get your attention. The appeal of Rocky derives that appeal just from that ideal. Before steroids turned Sylvester Stallone into a kind of parody of himself, he was the original average Joe as Rocky Balboa, a low rent gym rat who fought in local bouts and had no bigger dreams than just to have another go on the canvas. 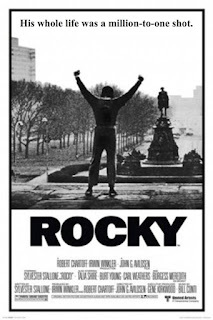 Rocky was the genesis of Stallone, an actor who also wanted to be a screenwriter. He peddled his story of Rocky Balboa all over Hollywood, and was mostly turned down. No one wanted to make a boxing movie. Boxing as a screen topic was thought to be a financial whirlpool. Gone were the days when an inspiring movie about a real life boxing hero might be expected to bring in money. Biopics like The Joe Louis Story and Gentleman Jim (about "Gentleman Jim" Corbett) could be expected to draw some crowds in the past, but, with the exception of Muhammad Ali, there were no real heroes in the boxing world whose story could be expected to draw an audience, at least in the late 70's. Stallone had one other stipulation that added to his struggle to get the movie made; he wanted to star as Rocky Balboa. But he was virtually an unknown at the time. His previous work on film had been limited to mostly uncredited walk-ons. Granted he had achieved some recognition as Stanley in The Lords of Flatbush, and was memorable as a competitor, "Machine Gun Joe" Viterbo, in the Roger Corman classic, Death Race 2000, but was otherwise a nameless face in Hollywood as far as his cinematic career was concerned. When he finally found an interested party in making his script into a movie, the powers that be considered several well-known names for the title role, including Burt Reynolds and James Caan. (Or...consider the role being played by Robert Redford, another actor who was contemplated to play Rocky. OK, maybe Reynolds or Caan I could see, but Redford???) But Stallone was adamant about his position and eventually prevailed. The background story in getting Rocky to film is inspirational enough, but the movie is one to really make people want to stand up and cheer. It was this movie, coupled with the Bonnie Tyler song which inspired this blogathon that really got my juices boiling on inspiration. It is a feel good movie that can make the viewer want to get up and go out and beat the odds on his or her own personal endeavors. 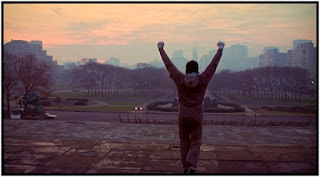 There is something about Rocky Balboa (Sylvester Stallone) that induces pathos in the average viewer. He is an average Joe who is just trying to get along in a gritty world. He fights in low budget fights in his local gym, making probably just barely enough to pay for the bandages and antiseptic to heal for the next bout. His real job is as a collector for a loan shark. But Rocky has a good heart and doesn't like to bully the deadbeats who are not paying up their debts. This doesn't set real well with the loan shark, but he is sort of a father figure to Rocky and tries to encourage him., even showing an interesting in his boxing sideline. 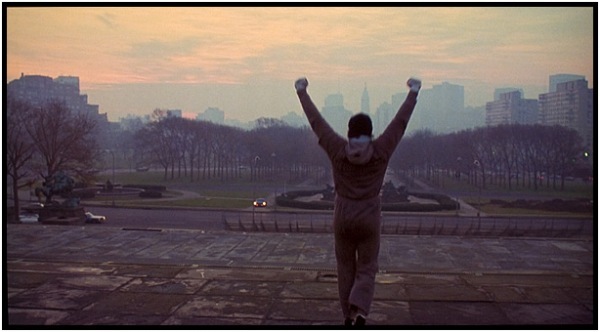 Rocky lives alone with his turtles and a goldfish, in a dingy apartment in Philadelphia. His best friend, Paulie (Burt Young) is his only real human companionship. 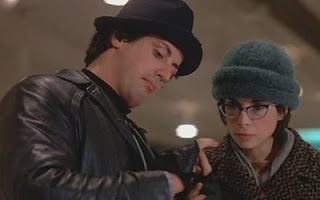 Paulie's sister, Adrian (Talia Shire), is a source of unrequited love, since Adrian is shy and mousey and doesn't seem to even notice the attention Rocky strives to give her. 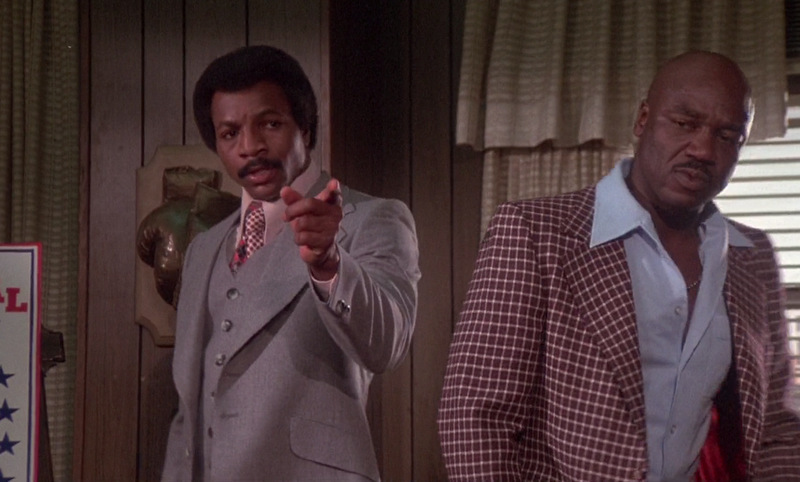 At the same time, the current heavyweight champion, Apollo Creed (Carl Weathers), is struggling with his own demon. He has planned a bout to usher in the bicentennial year of 1976, to be fought on New Years Day, but his scheduled opponent has had to back out. Ever the self-promoter, Creed wants to fight just a scheduled, but is left to find an opponent who is willing and healthy enough to be ready in just six weeks. (It's Thanksgiving when Creed finds out the bad news about his scheduled opponent.) Creed comes up with a great promotional idea that will fit the bill. He will fight an unknown, thus giving the idea that anyone can achieve his chance at stardom, even if he is a common ordinary everyman. 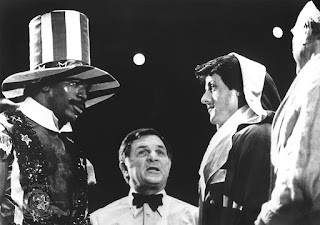 Creed and his promoters settle on Rocky because Creed likes his fighting moniker, "The Italian Stallion", since Italians had originally discovered America. (Yes, to all you fellow iconoclasts out there, it has been revealed in recent times that Columbus was not the first, but this is the movies and they can use any accepted belief they want). Rocky receives word from his former gym manager, Mickey (Burgess Meredith), that he is wanted for a fight. Mickey, who had previously kicked Rocky out of his gym, now wants to help him train for his imminent fight. Everybody wants a piece of the action, to attach themselves to this rising star. Paulie wants to latch on because his own life is in a shambles, Mickey wants to be included because his own star as a boxer faded years ago, even his mob connections want to get in on the deal. About the only one who has no dreams of fame and fortune from Rocky's rise is Adrian, who has now become his girlfriend. She is actually the only one concerned for Rocky's health, because even he has been snapped up in the potential credit that could be gotten from his 15 rounds of fame. But 15 rounds is all Rocky really wants. He expresses a desire to Adrian that although he does not expect to beat the champion, he really just wants to "go the distance", to give the champ all he can handle for the full 15 rounds. In this dream, as long as he isn't defeated before the full fight is fought, he still comes out a winner. As such, at first his training is haphazard. 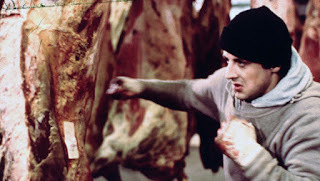 He punches on sides of beef at Paulie's job in a meat packing plant. He jogs through the streets of Philadelphia, (unmolested I might add, probably not as good an idea today, but this was the mid-70's and perhaps Philly's crime rate wasn't that bad). Eventually the acerbic Mickey takes a hand in getting Rocky ready for a real fight. Training him to learn how to use his right hand (Rocky is a southpaw) proves to be the toughest challenge, but eventually Mickey does get Rocky into some semblance of shape and ready to go. But the night before the fight, Rocky starts to get intimidated by the significance of the situation. Even more intimidating is the pure colossal arrogance Creed shows as he enters the ring on the night of the fight. OK, so Spoiler Alert! 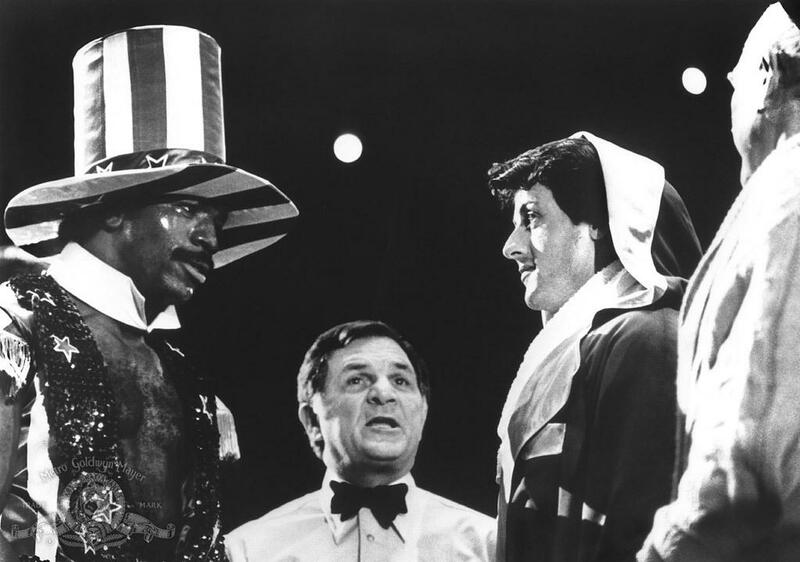 Rocky does not win the fight, but it is a split decision, with one of the judges ruling that Rocky was the winner while the other two vote in favor of Creed. So why do I call Rocky inspirational? Well, just because a guy doesn't beat the odds doesn't mean he can't be inspirational. Rocky Balboa stood tall against the odds and was still able to hold his head high and that's enough of an inspiration for me. Time for me to go out and buck the odds (of getting home safely in the local traffic...) Drive safely, folks. Beautiful and comprehensive coverage of one of the finest films of the 1970s. Low key yet so so powerful, a character study that culminates in an very exciting action-packed climax. 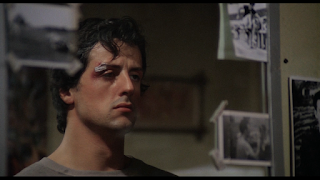 Thank God nobody played Rocky but Sly...he is very underrated as an actor, screenwriter and filmmaker. This film would mae a terrific double feature with OIn the Waterfront. 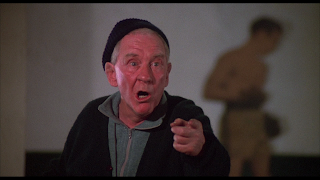 Balboa has a lot in common with Marlon Brando's "could have been a contender" Terry Malloy. 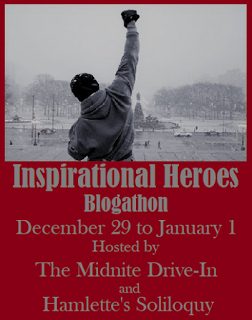 What a wonderful kickoff of the Inspirational Heroes Blogathon. Cheers! 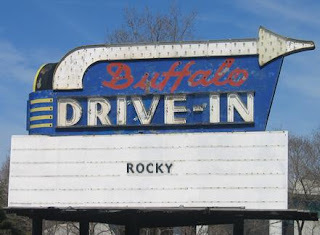 I always considered Rocky to be the apotheosis of Stallone's acting career myself. Most of his other movies, you could transpose one character to a different movie and no one would notice the difference... Thanks for reading. Great choice and a great article. I don't recall a lot of "feel good" movies in that period, but Rocky beat the odds. If that character and that movie could do it, so could we. 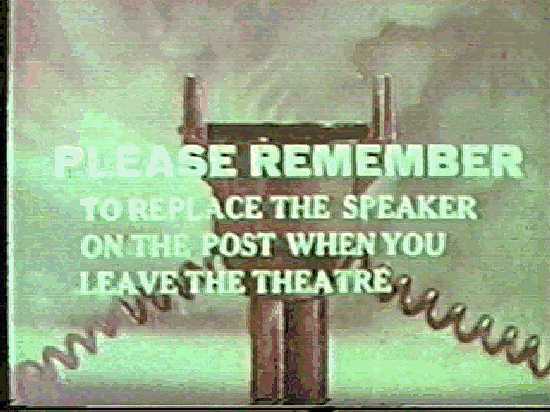 Well as far as feel good movies from that period what can I say... How about two of them...? "Nixon" and "Ford"... Thanks for reading. Beautiful summary of a beautiful movie. 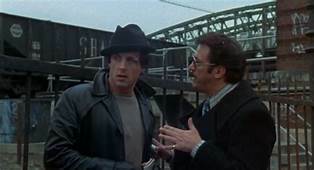 Minor trivia note: Stallone also did a brief role in Woody Allen's 1971 comedy BANANAS, as a mugger on a New York subway train. Yes, that would be one of the walk-ons I referenced. Thanks for reading. This film does make a person want to stand up and cheer. Rocky has a sweetness and a decency that do not undermine his determination and toughness. I love this film and this character. And Robert Redford as Rocky? Uh, no. Ryan O'Neal was considered too. As to how he would come off as a boxer... Ever see "The Main Event"? Thanks for reading. I really love this movie, as I grew up watching the franchise on VHS with my parents. 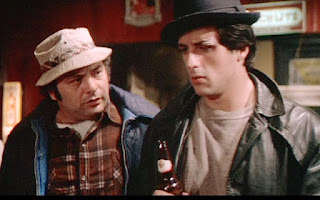 I kind of associate the character of Rocky with my dad in many ways -- they both struggle with some linguistic things like pronouncing words correctly, are kind, love animals, and my dad even has kind of the same face shape as Stallone. As a kid, though, we watched III and IV the most often -- must be my dad's favorites. When I rewatched this one for the first time as an adult, I was startled by how it's really a character-driven indie film. So, so good. I love all the Rocky movies although, Rocky V I can only watch on rare occasions, It's not anywhere near the quality of the others. Still need to watch Creed. I keep trying to get it at the library but its always checked out. I'm not a huge fan of Rocky, but he rather inspirational. It's interesting how his character somewhat mimics Stallone's experience in getting his script on film. I love that anyone with passion and determination can be a hero. Quite so. Thanks for reading.